As a follow up to my previous blog post, conservation treatment of the second of four sections comprising a mosaic column from Tell al-Ubaid, Iraq is well on its way! 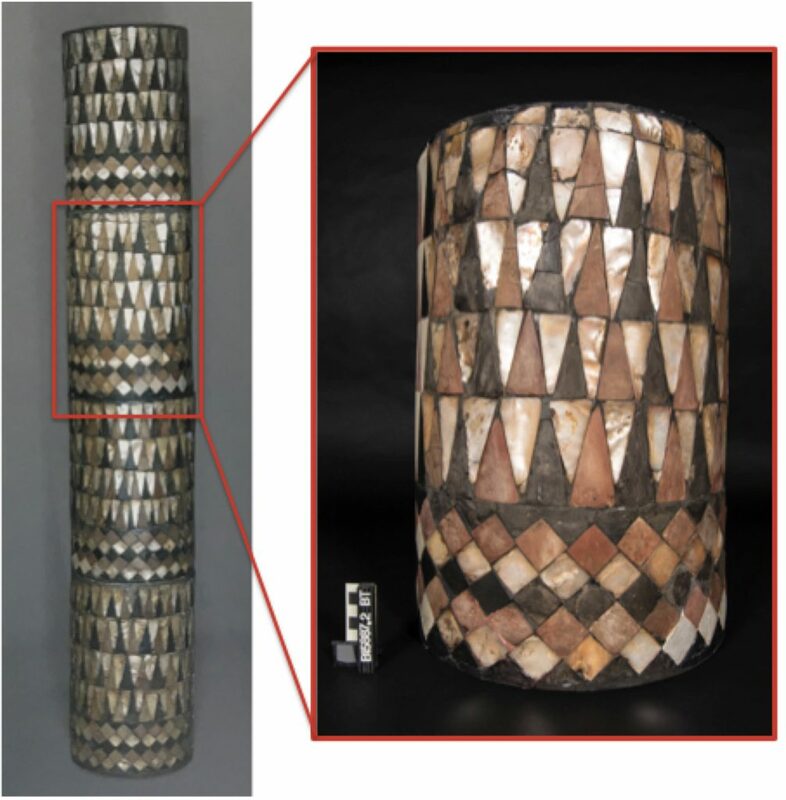 For a quick recap, the column is dated to 2400 – 2250 BCE (Figure 1). After centuries of burial, the triangular and diamond shaped shell, pink limestone, and shale tesserae (also referred to as tiles), were excavated in 1919 – 1924. 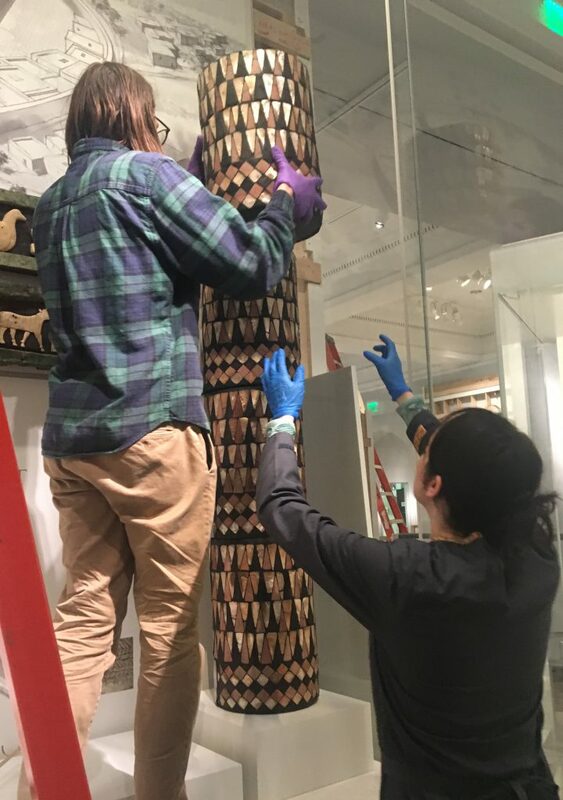 The original wooden column interior did not survive the centuries of burial, so after excavation, the tesserae were mounted with plaster to four hollow cylindrical supports of metal mesh covered with burlap. After nearly 100 years, shifts in the internal support have caused structural instability to each section. Figure 1: (left) Before treatment image of the four column sections stacked together to make a complete column. Image courtesy of The Metropolitan Museum of Art. (2003). Art of the First Cities: The Third Millennium B.C. from the Mediterranean to the Indus. The Metropolitan Museum of Art: New York) (right) Column section 2 detail, before treatment. First step of treatment: Remove tesserae from the current support. The plaster was softened with distilled water applied by brush, then carved away to expose the sides of the each tessera. 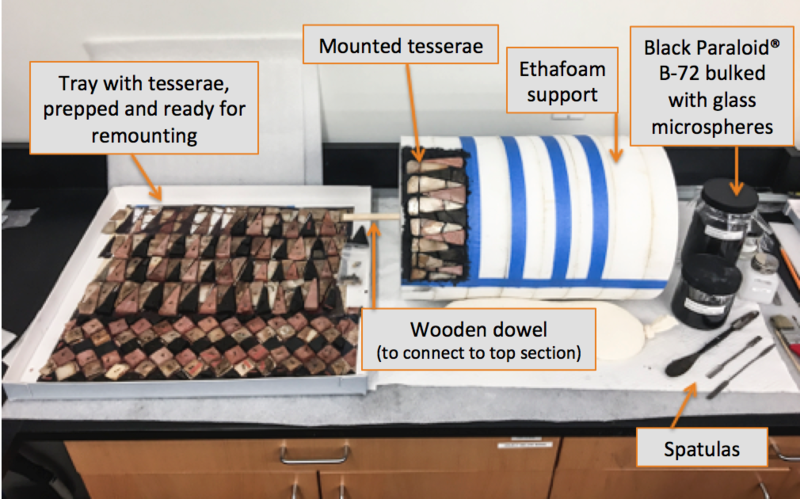 The tesserae could then be separated from the plaster and burlap backing one by one (Figure 2). Like the first slice of pie, the first piece was the most difficult to remove. Once extracted, access to adjacent tesserae became easier. Figure 2: (left) Removing plaster surrounding the tesserae with a scalpel blade. Plaster was first softened with distilled water. (middle) Carefully extracting a shell tessera from the plaster. (right) Shell tessera after removal from column section. The tesserae were removed from the support and placed on an enlarged reference photo in a tray to maintain the order of composition (Figure 3). 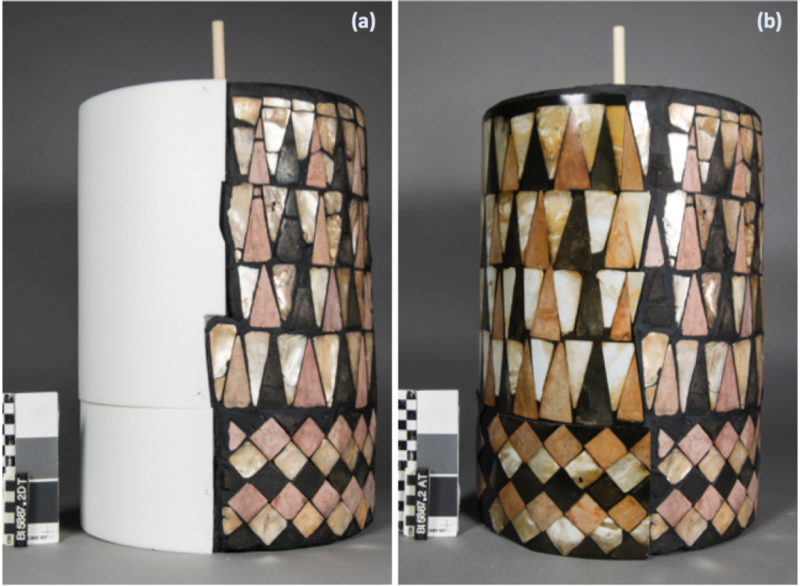 Figure 3: All tesserae were removed from the support and placed on top of a rolled out image of the column section to maintain their original placement. All that remains on the exterior of the cylindrical support is a layer of grey plaster and previously filled areas. As a bonus, the Egyptian female child mummy named Tanwa can be seen in the background, just outside of the Artifact Lab window! 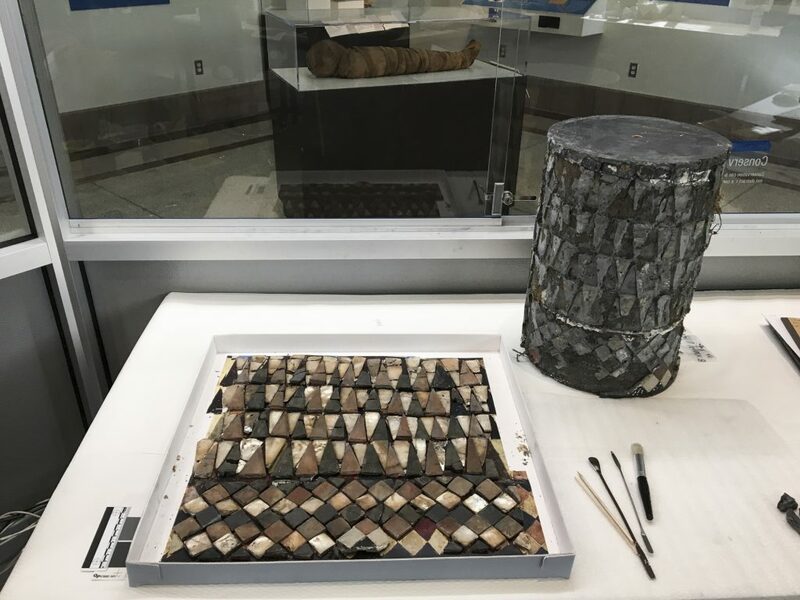 After removal from column section 2, all tesserae were covered with a layer of powdery plaster, which was removed with distilled water applied with hand-rolled cotton swabs. Medical scalpels were used to gently lift and remove thick remnants of plaster as well as adhesive from previous repairs. In addition, years of dark-brown dirt, dust and grime were removed with distilled water, and Stoddard solvent (a petroleum-derived organic solvent) was applied to the pink limestone and shell pieces to remove greasy grime trapped in the surface (Figure 4). 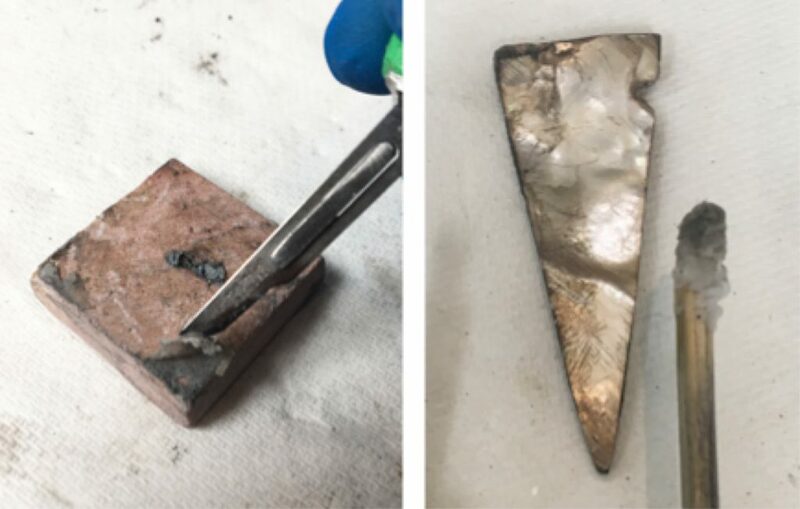 Figure 4: (left) Removal of adhesive and plaster remnants from a diamond shaped tesserae using a medical scalpel. (right) Shell tesserae being cleaned with distilled water. Note the dark grey-brown grime picked up on the cotton swab. 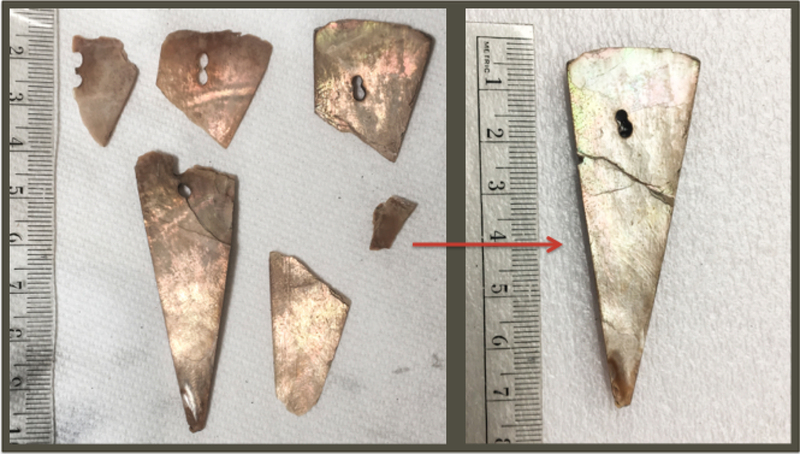 Once cleaned, tesserae that exhibited breakage such as cracks, detachment, and delamination were repaired with a thin layer of a semi-viscous solution of Paraloid® B-72 (ethyl methacrylate (70%) and methyl acrylate (30%) copolymer) resin in acetone. The majority of the shell tesserae experienced separation between the layers comprising the shell. Some even separated into several pieces, making their reassembly somewhat of a puzzle (Figure 5)! Figure 5: (left) A triangular shell tessera delaminated (separated) into six pieces. (right) The same shell tessera with all pieces adhered together with Paraloid® B-72. The shale was even more temperamental to remove from the column section (Figure 6). Shale is a soft sedimentary rock composed of mud, clay, and minerals, such as calcite and quartz. The inherent nature of the shale causes breakage and crumbling. Water can remove particles from the shale surface, therefore these pieces were cleaned with dry brushes and if needed, cotton swabs lightly dampened with distilled water. The most resilient material was the pink limestone. 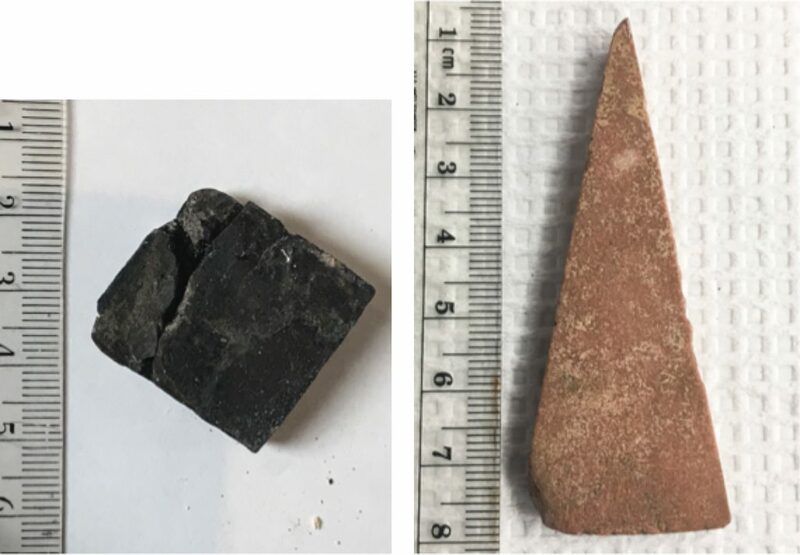 While some pink limestone tesserae are weathered on the surface, most likely from centuries of burial, these tiles exhibited very little breakage and cleaned up nicely with distilled water and Stoddard solvent (Fig. 6). Figure 6: (left) A diamond shaped shale tessera exhibiting a lack of cohesion, best observed around the edges, which caused cracks and areas of material loss. (right) A resilient triangular pink limestone tessera with a weathered surface, noted by the lighter, speckled locations. The pink limestone tesserae have strong cohesion and required very little repair. After a month of cleaning and repair of the shell, pink limestone and shale tesserae, their overall appearance is quite transformative. The tesserae look brighter and truer to their original colors (Figure 7). This is especially the case for the pink limestone, which went from a dark peach-brown, to a brighter light-pink hue. Figure 7: (left) Shell, pink limestone and shale tesserae after removal from the former support, and kept in their original arrangement. (right) All tesserae after cleaning and repair, ready for re-mounting to a new support. 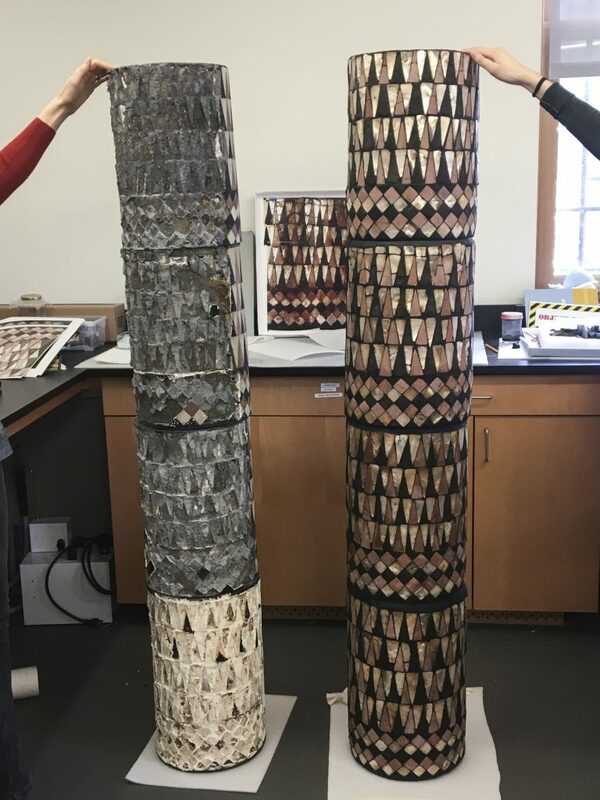 The next phase of treatment for section 2 of the mosaic column is to mount the shell, pink limestone, and shale tesserae to a new solid cylindrical support. 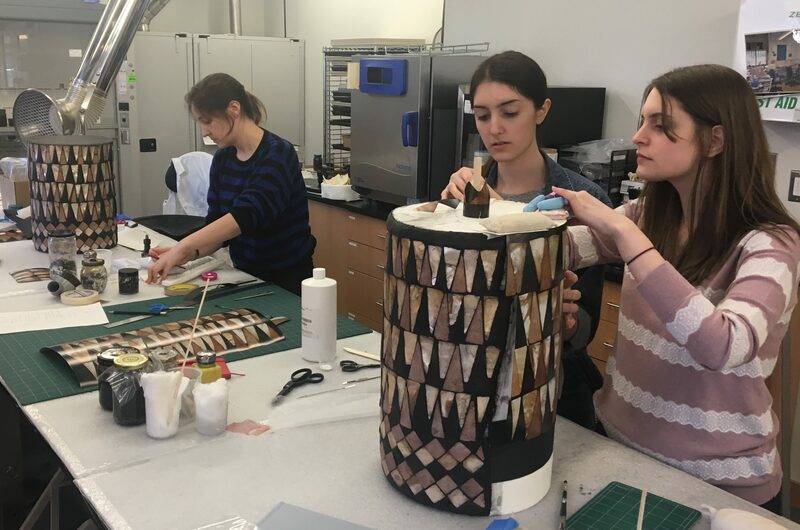 More information and updates on the column treatment progress will be featured in an upcoming post, so please stay tuned!